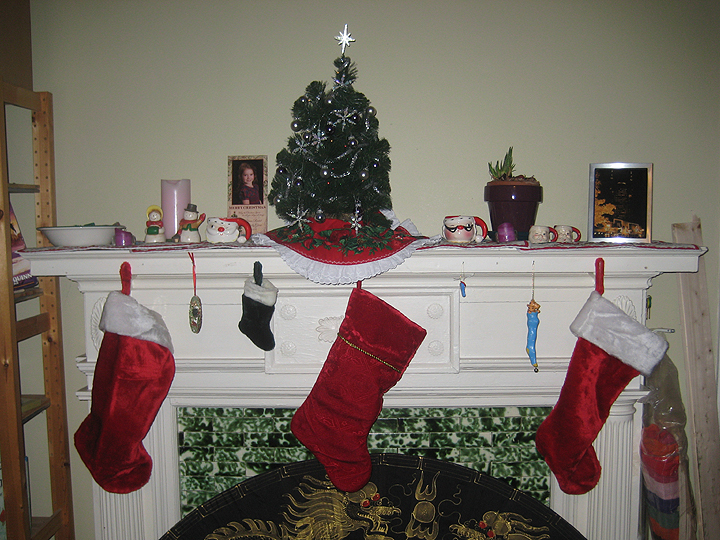 There it is, the extent of my holiday decorating. It is actually more than I can be bothered to do most years. The tree is twinkily and sparkly, covered in tiny, tiny lights. Which, really, what more do you need from a tree than lights? My cards are 3/4ths done (all addressed, 2/3rds written). I wish I could say the same about my shopping/making of gifts. I’m not this last minutes, I swear, just this year the whole season crept up on me. I blame November for being so warm. Categories: ain't nothin' much, dharma time, pretty as a picture | Permalink. Awww, look at that beautiful card on the mantle there!! 🙂 (Mantel? Mantle?) And I love the decorations! Holiday cheer! !